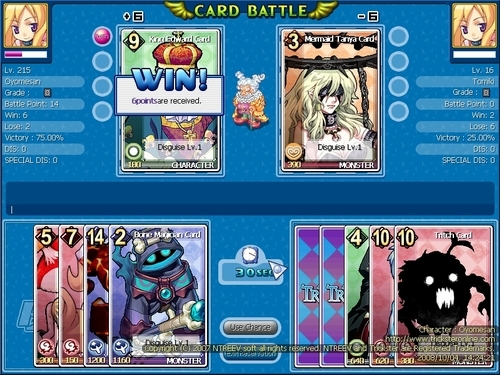 Card Battle is a turn-based game, and can be considered as a mini game within Trickster Online. Right-click on another player, and select ‘Card Battle’ at the bottom of the menu. When selected, the player of choice will receive an invitation to play Card Battle with you. The user may either accept or decline. Each player is required to pick 5 cards to play with. Keep in mind, you can only select up to 2 cards of the same type and same number. However, you can select only 1 non-property card, and you can’t select one card twice. Once both players have selected 5 cards, put one card on the battle board, to compare it with the card of your opponent. The winner is decided by the Rules. If the card types match, the higher rank wins. If the card types differ, the lower rank wins. If the card types match, the lower rank wins. If the card types differ, the higher rank wins. After each game, the winner will earn points. The winner of the battle will be decided by the number of points won after 4 games. The points that are won, will be accumulated, and if you lose, the same amount of points lost will be deducted from your total score. If a battle ends up in a tie, an extra round will take place with 1 remaining card. If the battle results in a tie once again, another card will be issued to each player, and the process will repeat until the winner is declared. The winner of the Card Battle will earn experience points in proportion to the amount of points won. The higher the number of wins and points, the greater the increase in experience points. Other prizes that can be won, are items, card and galders.